The strategic thinking and comprehensive suite of services The Raben Group has provided the Council on Regional Economic Expansion and Educational Development has allowed us to expedite the growth of our organization, quickly develop education initiatives that will dramatically change the educational landscape and opportunities in region, and has given us visibility as education change makers in Texas. – Richard Castro, Chairman of the CREEED Board. 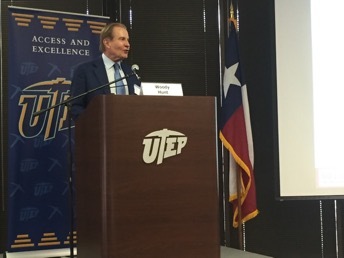 In the far western corner of Texas, a group of prominent business leaders recognized that there wasn’t a single group working with a strategic focus to address the educational challenges facing the El Paso region. With the recognition that educational attainment and economic expansion correlate, they decided to form the Council on Regional Economic Expansion and Educational Development (CREEED). CREEED’s mission is to improve the quality of education in the region and ensure that more students are prepared to participate and thrive in both college and the workforce. This is the only real means to economic expansion and opportunity—both individually and as a communal benefit. Based on The Raben Group’s long history in the education reform space, CREEED hired us to guide them in a strategic planning process to determine the best way to organize their resources and make the greatest impact in improving the education landscape in El Paso. Raben worked with CREEED to help identify the core issues within the education reform space and embed CREEED into policy discussions and advocacy efforts on this set of issues, including: school choice, college readiness, and educator effectiveness. Since then, we have been retained to manage the day-to-day communications, advocacy, and programmatic operations of CREEED. Raben has been serving as CREEED’s communications department since 2015—managing their messaging, media relations, daily pitching, editorial board meetings, and rapid response communications. Through Raben’s engagement with CREEED, the organization has done a credible job telling the story of educational challenges and opportunities facing the El Paso region both to regional press and to the wider Texas and national community. This has been done through a series of op-eds and relationship-building with press outlets. Most importantly, through this communications work CREEED has been able to mobilize the community, academic, and non-profit sectors to work collectively to address El Paso’s education shortfalls. Part of these advocacy efforts have included expanding and enhancing CREEED’s relationships with superintendents and educators, the Texas Higher Education Coordinating Board, the Texas Education Agency, and funders in the education space. These relationships have resulted in strategic partnerships and made CREEED the voice for education reform in the El Paso region. 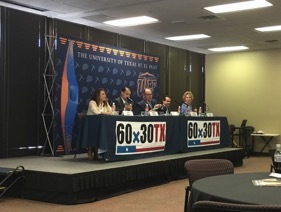 This is evident in their participation in a roundtable discussion with U.S. Secretary of Education John King on education issues impacting border communities as well as their joint conference with the Texas Higher Education Coordinating Board to look at the status of postsecondary education attainment in the region. CREEED now weighs in on state and national education issues that could impact education resources and innovation in El Paso with an attendant view of effective economic development within the region. On the programmatic side, The Raben Group has managed the implementation of all the programs that CREEED funds. 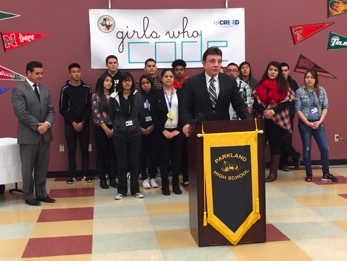 We helped CREEED establish partnerships with three local school districts to launch the first ever Girls Who Code clubs in the region as an effort to cultivate a generation of young girls with thriving careers in the tech and engineering fields. We have also helped them expand high school students’ access to dual credit courses so they can get a head start on their college coursework.